Oil production and exploration has always been one sector I have shied away from and there is one simple reason for it; it is far too dependent on the price of oil (obviously!). But I have recently read some interesting articles on junior oil producers which make me very interested in opening a position. Which brought me to the realisation that I haven’t spent much time valuing oil companies and as such, I need to refresh myself with the terminology, the methods to value an oil company and everything else to do with this sector. The best way for me to refresh my understanding is to write an article, and this has the added benefit that everyone else can learn too! So to start this series off, I will look at the single most important factor in the value of an oil company, and that is the price of oil. 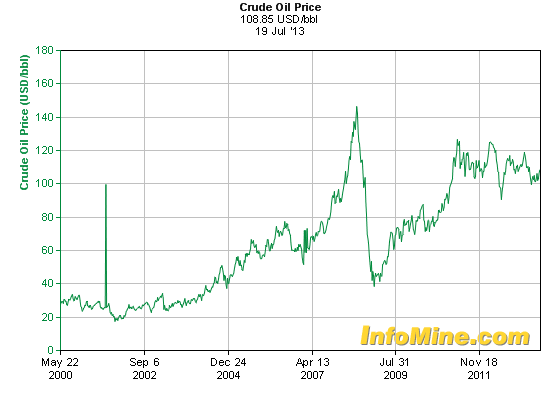 It isn’t hard to find, the website I use is InfoMine and their oil chart is below. So what does this chart tell us? Well the price of oil is fairly high, looks to be about on the long term trend since 2000, ignoring the big spikes and troughs. Been a bit flat last couple of years. So in summary, not much except that we don’t appear to be at a peak or trough, which is reassuring for an investor. And where is it going in the future? Who knows, I could name a dozen different scenarios that are quite possible and will cause radically different changes in the price of oil. This risk is one that you must just accept if investing in oil companies and the chart shows that the price could go either up or down. In the industry as a whole, with the new development of tar sands you may expect supply to increase. And if worries about a Chinese property bubble are true and they have a crisis you can bet the price of oil will go through the floor. I tend to focus on the downside risk for obvious reasons, who worries if the price increases and you make more money!? The downside is real, the likelihood of it happening is up to individual investors to decide. Of course, you can always hedge against it, using the methods shown in my Hedging currencies series but the position sizing is not as straightforward. Predicting the fall in value of a company given a fall in the price of oil is difficult, never mind the fall in the market valuation. Then there’s the risk that even a modest decrease in the oil price can cause liquidity problems for the company and even bankruptcy. That dramatically affects the value of an oil company for obvious reasons! Alternatively you could go long a company that is undervalued and short a similar company that is overvalued (if you can find one). That avoids the position sizing issue but doesn’t guarantee an effective hedge, the overvalued company could increase in value far faster than your undervalued company. So there is no way to really eliminate all the risk, hedging could provide some limited protection if desired but you always have to think about the effects of oil changes to value an oil company regardless. A quick look at the chart should give a good indication of whether it’s a good or bad time to invest i.e. you don’t want to investing at the top of a peak and assuming high prices will continue. Likewise you may invest after a huge decline expecting that the price will recover but ensuring a conservative valuation regardless. Now this article may seem like it hasn’t really said anything, and that’s kind of the point. The most important factor in the valuation is something you have no control over, and little idea of where it will go in the short and possibly long term. That is a risk. In the next part I will move onto oil exploration, the first step on an oil companies journey and look at how the industry operates, how money is spent and made, and the key metrics that are used for evaluating production and oil reserves.